Pauline Gagnon's Blog: Did we build the LHC just to find the Higgs? Two weeks ago, at a seminar held at CERN, the OPERA collaboration revealed their astonishing observation: neutrinos might move faster than light. The finding is currently under scrutiny in the scientific community. While the result downstream at Gran Sasso speaks for itself, upstream at CERN things are no less intriguing, with high-tech GPS systems, novel techniques for accurately measuring the time, and unique ways keeping the initial particle beam stable. Take away one ingredient and the accuracy needed for the final measurement is spoiled. 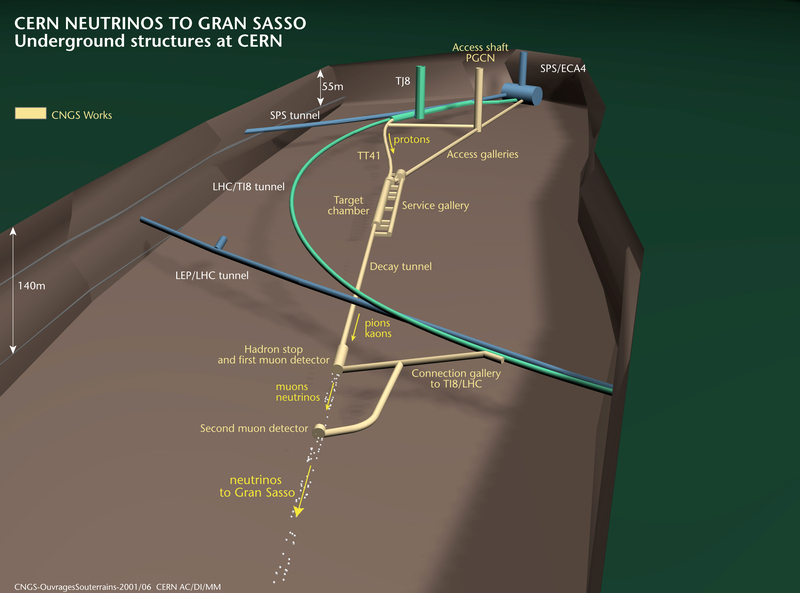 Underground installations of the CERN Neutrinos to Gran Sasso (CNGS) project. CERN produces neutrinos by sending a beam of protons to hit a target. The collisions produce a secondary beam, which mostly consists of pions and kaons that decay in flight within an evacuated tunnel. Their decay products are muons and muon-neutrinos. An absorber stops the pions and kaons that do not decay, while the resulting muons are absorbed by rock within a kilometre and the muon-neutrinos continue through the earth’s crust towards Gran Sasso. “In order to provide OPERA with a very stable neutrino beam, it is crucial that the primary proton beam first hit the target in a very precise way. Any change in its alignment, as well as any change in the subsequent focusing elements, is reflected in changes to the muon beam and therefore to the neutrino beam,” explains Edda Gschwendtner, the physicist in charge of the CERN Neutrinos to Gran Sasso (CNGS) secondary beam. The flux and profile of the muons, the ‘sister particles‘ of the neutrinos, are continuously monitored and the beam is stopped automatically by an interlock system if a deviation from the nominal values is detected. Should an anomaly in the beam persist, a team of experts is on stand-by around the clock to intervene and fix the problems. Any measurement of velocity implies a calculation of the time needed to cover the given distance. Beams Department engineers Javier Serrano and Pablo Alvarez, in collaboration with OPERA researchers, have been performing OPERA’s time measurements with outstanding accuracy. “We measure the time using very accurate GPS receivers,” says Javier. “We provide the experiment with a time measurement made between the Beam Current Transformer (BCT) – an instrument that monitors the intensity profile over time of the primary proton beam and is positioned just before the target – and a point just before the experiment’s electronics.” Researchers from the OPERA team have measured other possible contributions to the time of flight of the neutrinos, as well as the delay calibrations not included by CERN’s calculations. At Gran Sasso, the GPS time receiver was positioned at the surface. An 8km optical fibre linked that reference point with the heart of the detector where the neutrinos arrive. Special techniques were applied in order to accurately measure the length of the optical fibre – and therefore the associated delay – for the overall timing calibration. “The optical fibre length calibration was a limiting factor in previous experiments that attempted to perform measurements of the particles’ time-of-flight,” continues Javier Serrano. The CERN timing experts, in collaboration with the OPERA team, provided a very accurate time distribution of the primary proton beam, which is assumed to correspond to the profile of the neutrino beam arrival time. This plays a crucial role in the off-line calculation of the neutrinos’ time of flight. CERN surveyors also used GPS receivers to provide an accurate position for the target and the BCT, the points at the origin of the time measurement. On the Italian side, OPERA researchers worked collaboration with Mattia Crespi’s geodesy group from the University of Rome to measure the position of the centre of the detector using both GPS and other standard topographical techniques, linking the surface GPS points to the underground cavern. This involved stopping the traffic on one side of the motorway from which the Gran Sasso Laboratory caverns are accessed. “We provided OPERA with the co-ordinates of the target here at CERN, which were transformed into a global co-ordinate system (ETRF2000). Using this data, the OPERA team and the Rome group were able to combine measurements from the two sides to accurately calculate their distance. The determination of the beam line elements at CERN came with an overall uncertainty of 2 cm as it was based not only on GPS data but also, for the underground points which cannot be measured by GPS, from precise measurements performed at the time of the LEP construction,” says Dominique Missiaen, Head of the Survey section at CERN. “Many ideas are currently being exchanged within OPERA and CERN, but I think a better understanding of the time structure of the neutrino beam at its source would contribute to the quality of the measurements,” concludes Pablo Alvarez. Are you wondering when we will have a second measurement of the neutrino’s time of flight? Dear old Albert might have told us: “Relatively soon”. How can experts reach such a high accuracy using GPS receivers? Are they the same instruments as the ones we have in our cars? Not exactly… Standard GPS systems installed in cars typically use only one of the two or three available signals emitted by the global satellite system – each one with a different encoding. In this way, standard GPS receivers are able to provide co-ordinates of a given point within about 10 metres. On the other hand, the GPS instruments used by surveyors and time experts can analyse all three signals as well as the carrier waves themselves, and can therefore reach a much higher accuracy, down to a few millimetres and nanoseconds. “In addition, the experts perform their measurements over a long period – up to 24 hours for precise position determination– and then apply statistical corrections to get a very precise result,” says Mark Jones from the Survey Section at CERN. Do you have ideas, questions and/or suggestions? The CERN Press Office and CERN publications such as The Bulletin are not in a position to judge any new theories explaining OPERA’s result. However, the peer-review process is a very well established method that the scientific community has put in place to discuss theories, ideas and results. If you think your ideas or work are worth further exploration, we advise you to follow the standard procedure used by scientists and submit your work through the established channels (each publication has its own set of rules, so please consult the relevant web sites).